Jewish objection to the Angel of the Lord being Divine usually hinges on one of two points: man can’t see God and the Lord is ‘one.’ In this missive we’ll see that one of those points, that man cannot see God, is utterly put to rest. The first appearance of the Angel of the Lord, at least as described by that specific title, is in Genesis 16. 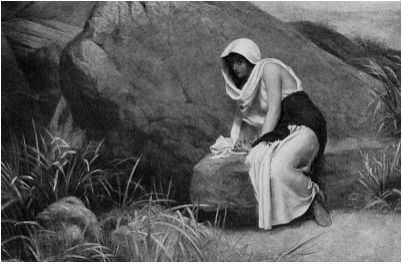 Hagar, treated harshly by Sarai, had fled into the desert and the Angel of the Lord finds her resting by a spring. 13 Then she called the name of the Lord who spoke to her, “You are a God who sees”; for she said, “Have I even remained alive here after seeing Him?” 14 Therefore the well was called Beer-lahai-roi; behold, it is between Kadesh and Bered. Folks, Christendom has lots of theological contortions they go through to dodge uncomfortable truths. This is one of those most uncomfortable truths that Judaism seeks to dodge. A side point that I find interesting is that Hagar is amazed that she saw God (the Angel of the Lord) and yet lives. To my knowledge, the Torah had not revealed any sort of injunction against seeing God, yet she clearly understands this to be a terrifying truth. This is evidence that they knew much more than is revealed up to this point in Scripture. Indeed, the bread crumb trail of evidence in Genesis indicates that they had all of the Torah prior to our hearing it from Sinai! But, I digress. So, what did Hagar see? The only reasonable conclusion, one explicitly stated in the text, is that the Angel of the Lord is God. This point will become more apparent as we proceed. A closing thought: Why do we find it so hard to comprehend a God who loves His people so much that He often reveals Himself in ways that they/we can have tangible evidence of His nearness and involvement in our lives. While the significance and Person of the Angel of the Lord is key for Christendom to understand Yeshua’s relationship to the Torah, these manifestations are equally important for Judaism in understanding that the same God who showed Himself as a pillar of cloud and a pillar of fire can also show Himself as a Divine Man who can interact relationally with his creation. Truly, understanding the significance of the Angel of the Lord is significant in tearing down and bypassing the traditions of men we have been taught. The simple truth of the Word is ever so much more exciting than mans explanations about why it doesn’t mean what it says. This entry was posted in Angel of the Lord, Deeper Study and tagged angel of the lord, Christophany, Genesis 16, hagar, memra, Yeshua. Bookmark the permalink. So this Angel of the Lord series is going to be a book, right? While I live the book and it’s specific target toward Jews, the author errs in stating that Torah is optional for nob-Jews. Otherwise, great little book. Ah, Asher Intrater. He has many good insights. I enjoy his teaching, although we do have some points of disagreement.